Besides being the first type of Art listed on Historical Art Timelines, Prehistoric Cave Art served a very important purpose for modern day scientists. Before the 1879 discovery of this Art, prehistoric artifacts found in European caves had led scientists to believe that ancient humans lacked intelligence. The discoveries of their Art made an incredibly important difference in the previous theories scientists had formed about these ancient humans! Cave paintings and carvings demonstrated an intelligent appreciation of beauty, equal to that of any intelligent “modern” artist. Unfortunately, original theories too often still remain. The silly Cave Men of the modern television commercials illustrate this biased misunderstanding well. In each commercial situation, the clever but somewhat “scruffy” looking cave men are continually being confronted with insulting misconceptions about their intellect. Although we will never exactly know the emotion and inspiration of cave art from the original artists, most people are capable of understanding the natural primitive and basic human desire that fuels the purpose for creating something beautiful! The carvings and paintings found in this Packet are not original “photographs”. British Silk-screen artist, Douglas Mazonowicz, created these life-like reproductions. Photographing some of the examples would have been impossible, considering the large size of the paintings and narrowness of the cave. Much of this art is located in caves now closed to the public, in order to prevent damage caused by modern tourist traffic. LINE and SHAPE are important Art Basics for this packet. When choosing to duplicate this style of painting, the natural COLOR choices are very important! Try to find paint that is similar to these natural colors. Petroglyphs will take advance preparation and planning but they are impressive. A project painting engraved plaster “rocks” can also become a lesson of instruction on both NEUTRAL COLOR, and SUNKEN RELIEF, with a few minutes of advanced instruction and discussion (Grades 3-5). Prehistoric cave and rock art is still being discovered in many parts of the world, but it is deep within the caverns of Southern France and Northern Spain that the oldest and most magnificent paintings (pictographs) and engravings (petroglyphs) exist. Before the late 1800’s, it was generally thought that our ancestors, who lived thousands of years ago, were illiterate, animal-like creatures that lived in caves, made most things from stone, and growled and fought with their neighbors by whacking them on the head with a wooden club. These original theories of prehistoric people have been proven completely wrong by more complete study of Ice Age art. Many of the masterful paintings found in France and Spain prove these ancient artists were very intelligent, inventive, imaginative, and had a high level of artistic ability. 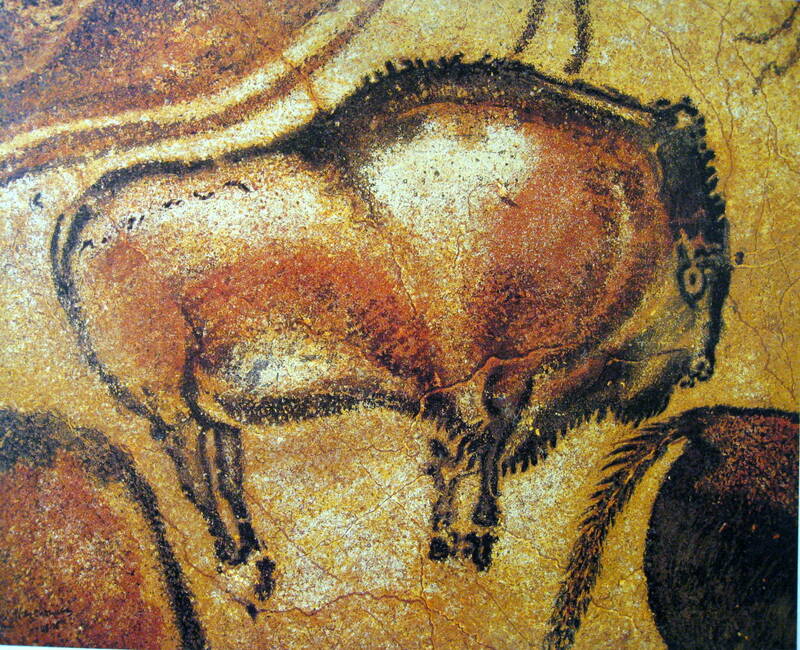 The very first discovery of prehistoric art was in 1879, at a cave called Altamira, in Northern Spain. An amateur archaeologist, Don Marcelino Sautuola, had been excavating around the cave entrance when his young daughter wandered off to explore deeper in the cave. Her sudden cry of “Toros! Toros!” (“Bulls! Bulls!”) was the first indication of the existence of prehistoric art. 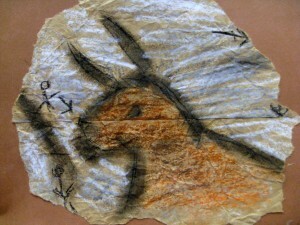 Today, cave art is an accepted fact but that was not so in the 1870’s. The many powerful bison, painted with artistic mastery over the natural rock bulges on the low ceiling, were immediately considered the work of some modern master painter. Sautuola was accused of trying to pull off a forgery with the bison paintings his daughter had supposedly found. His reputation was ruined. It was not until 23 years later, after further discoveries were made in caves of France, that the paintings were proven authentic. In the meantime, Sautuola had died a sad, disappointed and embittered man. During the years that followed, every known cave in France and Spain was re-examined for traces of prehistoric art and several fine works were discovered in caverns originally considered bare. After many fresh discoveries were found, an entirely new concept of the nature and artistic abilities of our early ancestors eventually came to be accepted. It was then that the great painted ceiling at Altamira was finally recognized as authentic prehistoric art. The Ice Age began about half a million years ago. Gigantic sheets of ice covered many parts of Europe, Asia, and North America. For many thousands of years, our early ancestors found shelter from the harsh cold inside caves. Because the caves were so dark and damp, people lived near the entrances, where they could be protected from the weather and occasionally look out at the sun. But some cave dwellers went deep inside the caves to paint and carve animals on the walls and ceilings. Archaeologists have only been able to guess what led these prehistoric artists into the dark caverns but they have uncovered many clues to help them understand more about these mysterious works of art. What we now know about these prehistoric people is that they probably looked very much like modern people and their brains were just as large as our brains. These primitive people were also skilled with their hands and made many kinds of tools. They lived together in family groups, or clans, and probably knew how to peacefully cooperate with each other in order to find food and shelter. These people also knew how to use fire to make their lives easier and a little more comfortable. About 10,000 years ago, the weather turned warmer and the ice sheets started to melt. Thick forests began to cover the once frozen land. People began building huts and shelters and left the dark caves. The paintings and engravings found on the cave walls were eventually forgotten. Today, most of these ancient caves are accidentally found. The artifacts and art that are found in the caves gives scientists valuable clues about the way prehistoric people lived. The permanency of the paintings is partly due to the makeup of the pigments they used. While searching in the earth for suitable stones and flints to create weapons and tools, early humans discovered large quantities of yellow, red and black clay soils. Clay ocher, iron oxide and carbon or manganese were minerals that they dug from the earth and ground to powder, between slabs of stone. Mixing the powder with varying quantities of animal fat, vegetable oil, blood, spit, egg, or urine, prehistoric artists made paint. The artist’s simple palette was limited to these three basic colors and intermixed to create a few additional shades of brown and red. Amounts of these simple colors have been found in the painted chambers of many caves, together with stone hand lamps and grinding stones. The colors are extremely durable, especially the red iron oxide, which is a pigment (color) most often found in prehistoric and primitive art. While these ancient artists could not have had the future in mind when they used these mineral powders for their paint palette, the fact is that the primitive painter’s oxides are the most permanent colors known to man—a lucky accident that was extremely fortunate for modern scientists. Scientists discovered that ancient cave artists carefully cleaned the cave walls before painting. The pigment was then applied using fingertips, fine animal hair, moss brushes, or blown through small, hollow bones to produce a delicate sprayed effect. The prehistoric artist was very selective in his choice of natural backgrounds. If a curve in the rock suggested the bulky shoulders of a bison, or the flaking calcite resembled the antlers of a deer, so much the better. Prehistoric artists took advantage of these “natural accidents” with an inventiveness that clearly demonstrates careful thought and planning went into the artwork. This is why ancient cave art also helped prove that ancient prehistoric cave dwellers were much more intelligent than was first believed. It took great courage and a strong motivation to penetrate deep caverns for the sole purpose of painting or engraving portraits of animals on the walls and ceilings. These dark corridors were the temporary homes of lions and cave bears. In the cold, damp, inhospitable atmosphere of the cave lurked still other dangers—pitfalls below and falling ceilings above. Many authorities have stated their opinions and theories about the reason for these creative efforts. Most agree on magic or religious motivation but some authorities still believe the question may never be truly answered, since these people had no written language and the artists are no longer alive to tell us why they painted in these dark, dangerous caves. In many caves, the art is found only in one specific area or chamber. With the walls filled, animal paintings would be painted over previous works, suggesting that only this particular area might have been used for a ceremony, which may also have been accompanied by music and dance. It is generally believed that the risk involved in creating these paintings, in the deepest depths of these dangerous caves, would rule out most other purposes such as decoration or education. There are several methods used to approximate dates of the cave paintings and engravings. For instance, in 1901, paintings were discovered in the French cave of Font-de-Gaume (Font duh Gome). These were covered with a clear stalactite formation that in places was an inch thick (location of TWO REINDEER painting). This proved the authenticity, as well as the age of these paintings. Extinct animals such as bison, mammoth, and aurochs, found on the cave walls of Southwestern Europe, provided additional clues about the age of other paintings. Scientific testing (called CARBON 14) of the bone and carbon found on the cave strata (layers of dirt and rock) also gives information about the approximate age of cave art. Within most humans there is a basic urge to look into the past so it is not surprising that the masterpieces of cave art have attracted great attention. Unfortunately, the crowds of thousands that visited the caves have caused severe problems. The cave walls have become contaminated by strange green algae, which threatens the paintings. It is for this reason that many of the great caves such as Lascaux (las COE), in France, and Altamira, in Spain, have been closed. These remarkable ancient paintings, so recently discovered, are invaluable, not only for their aesthetic qualities and importance in art history, but for the information they provide about people that lived many thousands of years ago. Discuss the dangers that confronted prehistoric artists inside the caves and the strong motivation needed to go there. Did you ever stop to think how dangerous it would have been to hunt wild animals using only spears? Would you have been a little worried or frightened? What if the had animal injured you? What else might you have eaten if you were a prehistoric cave person? Have class imagine a day in the life of Stone Age children—hunting and gathering, preparing food, mealtimes, preparing animal skins, ways these skins were used, creating tools, activities of families and games children may have played. Do you think children or their parents created toys to play with? What types of toys do you think they may have liked? Important Information about Prehistoric Art and One Modern-Day Artist These large Cave Art prints are not photographs of the real artwork found in these European caves. The prints are reproductions created so the modern world could discover what only a few have been privileged to witness firsthand. The artist who created these modern art works, these duplicated reproductions we are studying here, was named Douglas Mazonowicz and he was born in Wiltshire, England. Douglas graduated from the Swindon College of Art and taught Graphics at Farnham College of Art. A master Serigrapher (silk-screen artist), he became highly interested in European Cave Art in 1959, realizing that because of cramped spaces and undulating rock surfaces, photographic reproduction of these beautiful, ancient masterpiece images was unsatisfactory, if not impossible. To complete his researches, Mazonowicz lived for eight years in the cave regions of Spain and France. His creative paintings now allow us to see very realistic reproductions of authentic and historic European Cave Art.Mazonowicz’s dedication to the preservation of ancient art images brought him acclaim from the world’s authorities and historic institutions in the form of research associations, fellowships and even Smithsonian sponsorship (financial backing). The importance of his work has increased even more since the closing of many of these caves due to atmospheric deterioration. He has recorded here with paint, a priceless record of our modern ancestor’s intelligent and artistic messages to us who now live in the future. These ancient works of art can now be seen by all of us who will never get the chance to enter the caves and witness these paintings and engravings firsthand. 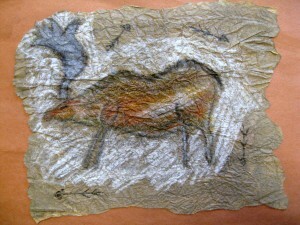 (Grades 3-5) Paint a cave art design on a ceramic tile. Larger tiles might be broken into smaller pieces, as if chipped off a cave wall, and to help lower cost of the project. Acrylic paint should match natural cave paint colors—burnt sienna (reddish brown), burnt umber (chocolate brown) yellow ochre (golden yellow), ivory and black. (3-5) Paint on flat rocks with acrylic paints or use black and red “permanent” markers on rocks. (All) Cut and crumple pieces of brown paper grocery bags. Smooth, then tape these pieces under desks or tables. 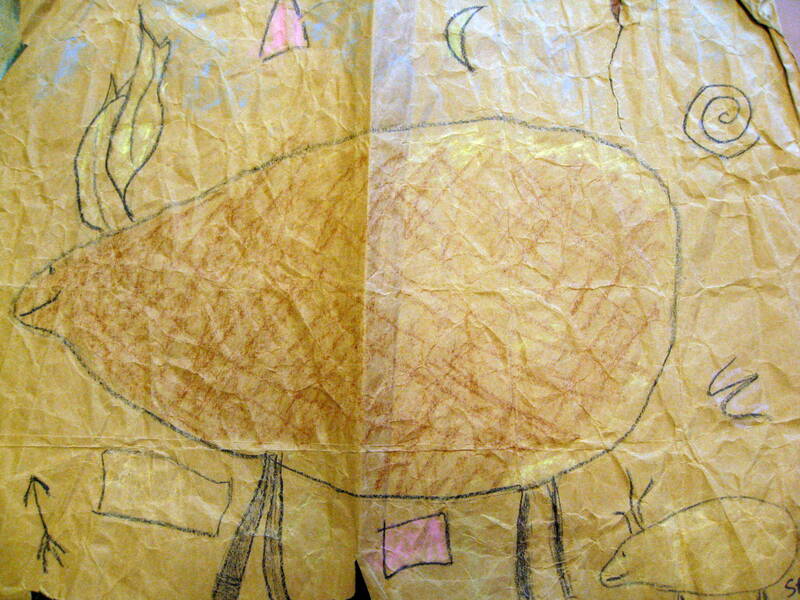 Younger students could use crayon to create cave drawings on the “ceilings” of their cave. Some 4th and most 5th Graders could use charcoal. CHARCOAL CAN GET MESSY! Encourage kids to blend the charcoal with their fingers for shading. Demonstrate how to shade as they watch (be brave—practice at home). (All) This project takes a little extra time and work to prepare but gives kids the feeling of actual prehistoric cave paint. Use a hammer to grind red rock (used for landscaping) into a powder. Mix this powder with enough cooking oil to make it barely moist (Teaspoon or Tablespoon at a time, depending on how much ground rock you have. A little oil goes a long way!) Store in a plastic margarine tub. Give kids enough of this mixture to cover the bottom of a small plastic or paper cup. Kids use small dab of this “paint” on fingertip to outline design on a piece of paper or flat rock. You will be surprised how far a little of this paint will go. When finished drawing, the parts that crumble off the paper can be tapped back into the container and used again. The oil soaks into the paper so that most of the paint will “stick”. Does not work that well to “color in” the design, so draw outlines using line or dots only. If drawn on rock, blow off excess and let oil dry. Don Marcelino de Sautuola was a wealthy nobleman. He owned an estate in a mountainous area of Northern Spain, called Altamira, which in Spanish means “high view”. One day, a hunter came to Don Marcelino’s estate to tell him about a cave the hunter’s dog had found on the property. The hunter was forced to rescue his dog when it became stuck inside this hidden cave. The hunter felt Mr. Sautuola would want to know about the cave. At first, Don Marcelino had no interest in the cave and didn’t even bother to check it out. The mountains of Northern Spain had many caves so it was not a big surprise that Altamira had one too. A short time later, in 1870, the Sautuolas had a new baby girl, named Maria, and the cave was soon forgotten. In 1875, when Maria was five years old, Don Marcelino remembered the cave. He and his daughter went hiking and found it. Don Marcelino cleared debris away from the cave entrance and the two of them explored it a little. The cave was interesting but not too important. In 1877, Maria’s father took a trip to Paris, France, where he attended a convention for archaeologists. (An archaeologist is a scientist who studies the remains of past human cultures.) At the convention, Don Marcelino learned about some skeletons that had just been discovered, in a place called Cro-Magnon Cave, in France. He learned that ancient Cro-Magnon people were considered relatives of modern human beings and they had once lived in scattered areas of Europe, Asia and Africa, between 40,000 and 10,000 years ago. This made Don Marcelino wonder if Cro-Magnon people had once lived in the cave on his Estate. He had not checked that carefully when he and Maria had first explored the cave. When Don Marcelino returned home from Paris, he was inspired by what he had learned at the archaeological convention. Mr. Sautuola asked Maria to keep him company as he began to dig near the entrance of the cave. Maria was happy to help her father and held the lantern so that he could see where to dig. Maria’s father investigated the cave entrance for about a year. The two of them uncovered stone tools, a few pieces of clay pottery, spearpoints, arrowheads, stones axes, chisels made of black flint, needles made of pierced shell fragments, bones and many other relics left by people who had lived in the cave about 1,500 years before. On a summer day, in 1879, Maria and her father went to the cave to dig again. Maria asked her father if she could explore a little deeper into the cave. Don Marcelino gave his permission but warned his daughter to be careful in the dark cavern. At the back of the cave, Maria found a huge chamber. Above her head, on the ceiling, Maria discovered many beautiful animal paintings. Maria thought the first animals she saw were bulls but they were actually ancient bison. In the flickering candlelight, the animals seemed to be running across the cave ceiling and their eyes appeared to be staring down at her. Other animals painted on the cave ceiling were deer, horses, wild boars and a wolf. The painted animals were a remarkable and unexpected surprise! Maria’s father wrote letters to several scientists. He invited the scientists to visit the cave at Altamira and see what his daughter had found. Only one of the scientists, Professor Juan de Vilanova, from Madrid, agreed to come. When Professor Vilanova saw the cave ceiling, he told Don Marcelino that Maria had made a very important discovery. Maria de Sautuola had found the first known cave paintings created by ancient human beings. Professor Vilanova said that Maria’s find was important evidence for archaeologists. The paintings showed an appreciation of beauty that was equal to that of any modern artist. Until Professor Vilanova saw the paintings, he and other scientists had believed that ancient cave dwellers were unintelligent, uncivilized and lacked the emotions or feelings of modern human beings. Professor Vilanova was excited and he and Maria’s father wrote letters to newspapers all over Spain! Suddenly, Maria and her father were famous! In 1879, the only “experts” on prehistoric people lived in France. The only way the world would recognize Maria’s important discovery was to have these French scientists see the paintings and agree on their authenticity. Don Marcelino and Professor Vilanova wrote the French “experts” and invited them to visit the cave paintings, but months passed and none of these men answered the letters or traveled to Altamira. The problem was that the famous French Archaeologist, Emile Cartailhac, refused to believe the paintings could be thousands of years old. Cartailhac claimed that ancient people did not have the ability to paint pictures as beautiful as Professor Vilanova and Maria’s father described in their letters. He believed these cave dwellers were not intelligent enough to create real art. Cartailhac also doubted that cave paintings would last thousands of years, even inside the protection of a cave. Because he was the leading expert of the day, other scientists also believed the paintings were faked. Nobody would come to look at them. Because of this, the newspapers called Don Marcelino a liar and a faker. It deeply hurt Maria’s father. Most Archaeologists of the time referred to Mr. Sautuola as “the crazy fellow who faked the cave paintings”. In 1888, at the age of 57, Don Marcelino died. Maria later told her children that her father had died because of his enormous sorrow about the ancient paintings. Five years after Don Marcelino’s death, Professor Vilanova, the only scientist who knew the paintings were authentic, also died. Maria and her mother decided that the cave needed protection. A large metal gate was installed to block the cave’s entrance. Maria continued to write archaeologists and invite them to examine the paintings. Her goal was to eventually clear her father’s ruined reputation. A respected professional archaeologist was still needed to view and authenticate the paintings of Altamira. 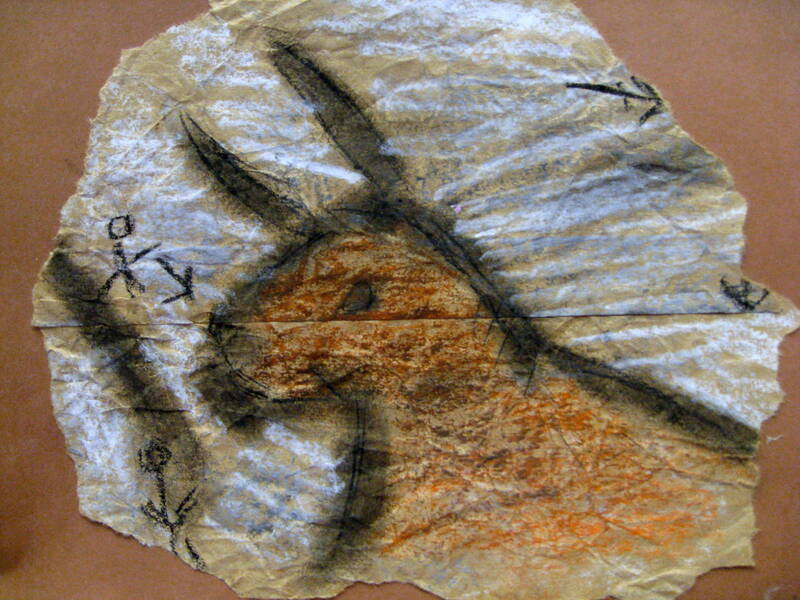 Eventually, throughout the 1890’s and early 1900’s, more cave paintings began to be discovered. Professor Cartailhac and other French “experts” finally had to admit that prehistoric people were far more similar to modern humans than it was first believed. The cave art proved that these people were intelligent. Professor Cartailhac remembered “the crazy fellow”, Don Marcelino de Sautuola, who had once claimed his daughter had discovered the first of these prehistoric cave paintings many years earlier. 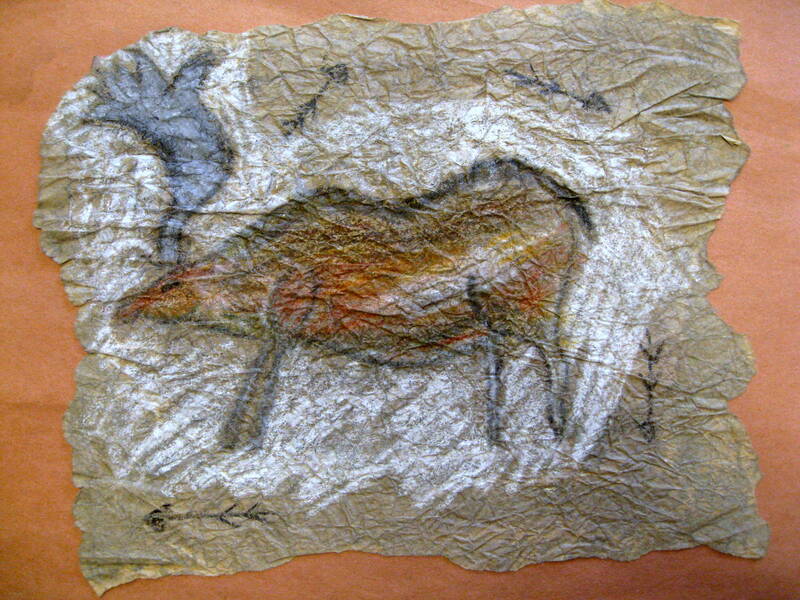 Twenty-three years after Maria discovered the cave paintings, she received a letter from France. 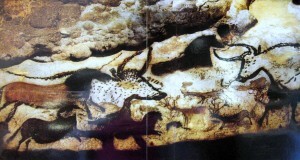 Professor Emile Cartailhac now wanted to visit the Cave of Altamira. One day, in 1902, Professor Cartailhac, along with prehistoric cave expert Henri Breuil, arrived at the Altamira Estate. Maria led the two scientists to the cave. It is said that when Professor Cartailhac saw the cave paintings, he fell to his knees in shame, and instantly knew the paintings were thousands of years old. 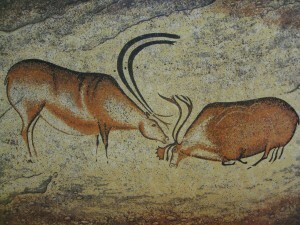 The art was very similar to more recently discovered French cave paintings. 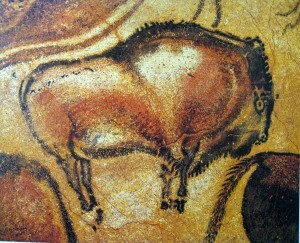 The Altamira art became known as “one of the seven wonders of the prehistoric world”, as one Archaeologist wrote. Cartailhac also knew that he had wronged an honest man and begged Maria to forgive him in her father’s name. After returning home to France, Professor Cartailhac wrote a famous article, titled “My Mistake”, in which he admitted to the world the terrible injustice he had done Maria’s father. The bison, horses, wild boar and deer that were discovered at Altamira, in 1879, are not found on the cave’s walls, but on the ceiling. Most of the massive animals had been cleverly painted upon and over the large natural bulges of rock that stuck out from the ceiling. The bulges and crevices of the natural rock provided the bison with a realistic three-dimensional appearance. When viewed with a flickering lamp flame, the shadows cast by the outcrops of rock animate the paintings, and help the bison appear to move. The bison seen in this print covers a natural rock bulge, and like the others, has been created in an interesting and complex technique. 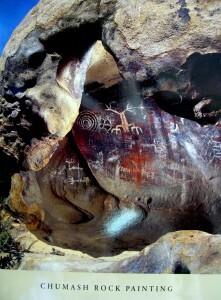 The horns of the bison are not painted, but deeply carved into the rock (petroglyph). Some parts of the painting have even been artistically scraped, to create the artistic effects of highlight and shadow. Recent scientific study shows that the breath of visitors causes the pigments (paint colors) to fade and in some cases completely disappear. This famous cave is now closed to the public. Is this Standing Bison an example of a pictograph or a petroglyph? It is both. Most of this bison is painted but the horns are carved (or engraved) into the rock. Point out the areas that have shading and highlight. In most cases, you will need to point out the areas of light and shadow to the class because, in most classes, younger, untrained eyes are not aware of this sort of detail. By pointing out the highlights and shadows in the pictures you choose, you are helping kids to pay closer attention to the detail of other paintings they will see in the future. If you choose to do this activity this time, in future Presentations (following this one) make a point to ask kids to show you areas of shadow and highlight, whenever possible. Also, ask them the direction the light is shining from. “Where is the light source coming from?” Younger eyes need practice to understand and see the shading and highlight. After leading kids in this activity for a few of your next classroom Presentations, kids should be able to scan and recognize highlights and shadows on their own. (Grades 4-5) Use charcoal to create a simple outline of a cave drawing on dark brown paper. Blend a little charcoal into the shape for shading. Highlight some areas with white chalk. (All Grades) Use *clay to sculpt a raised relief prehistoric animal. Use a toothpick to create line texture. *See Project Recipes page, Woody Dough and Coffee Dough. The cave art of Covalanas, in Northern Spain, is unique. This is because all of the paintings in this cave appear to have been painted by the same artist. How could scientists figure out that the same artist painted all of the paintings in this cave? Each artist paints in their own STYLE, whether it is cave art, modern art, or the artists in this classroom. If I asked each of you to paint an object that I had brought in with me today, each painting would be slightly different, even if the paintings were similar. That is because your eyes might see the object slightly different than the other artists in the room and you would create the object in your own STYLE. 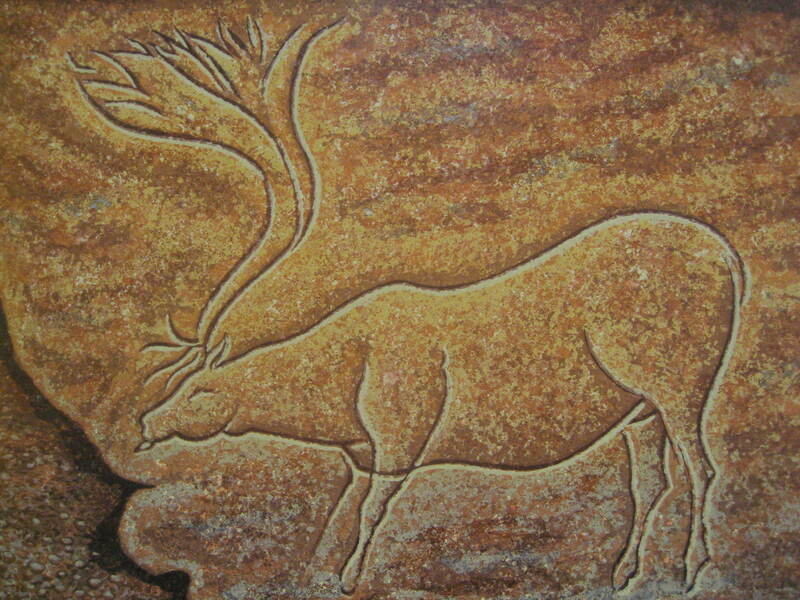 Usually, cave art was created over many years and some pictures were painted over the top of previous pictures. In caves where this was done, the STYLE of the art is slightly different, so scientists know that different artists created these different style paintings. The STYLE of this painting is also very different from the other cave art we will see today. After discussing and viewing all of the Cave Art pictures we are going to list and compare all of the STYLE differences that we can find. 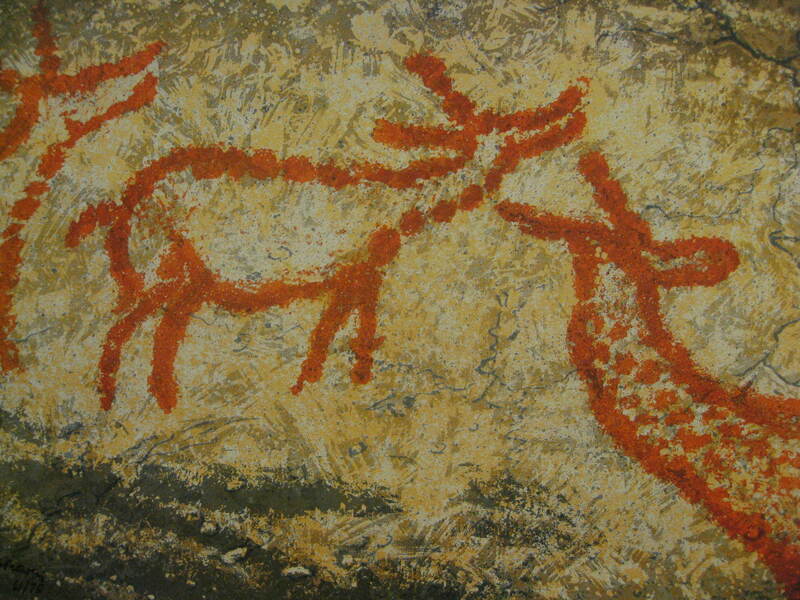 In cave art, it is very rare to find a group of animals inter-reacting as these deer are. The artist has painted the deer indicating that a noise, somewhere to the right, has alerted them. The deer look up from their grazing toward the source of the sound. The two deer on the left point their noses upward, as if sniffing for a predator. The deer on the right actually turns its head around to look behind it, towards the sound. This scene, which is full of movement, was captured in the very creative mind’s eye of a prehistoric artist some 17,000 years ago! It took planning to create movement in this picture. (ALL GRADES) Very, very, lightly, draw a large animal shape to fill the page of a 12” x 18” piece of gray construction paper. Use red tempera paint and your fingertip to create an outline of dots around this shape outline you have drawn. Dots do not need to be spaced the same distance apart. Arrange some dots closer together than others, the way this artist did. You are now painting the very same way an ancient, prehistoric artist did some 17,000 years ago! Scattered throughout the Vézere Valley, in the French region of Aquitaine, are traces of the humans who lived there thousands of years ago. In this valley are 25 decorated caves. 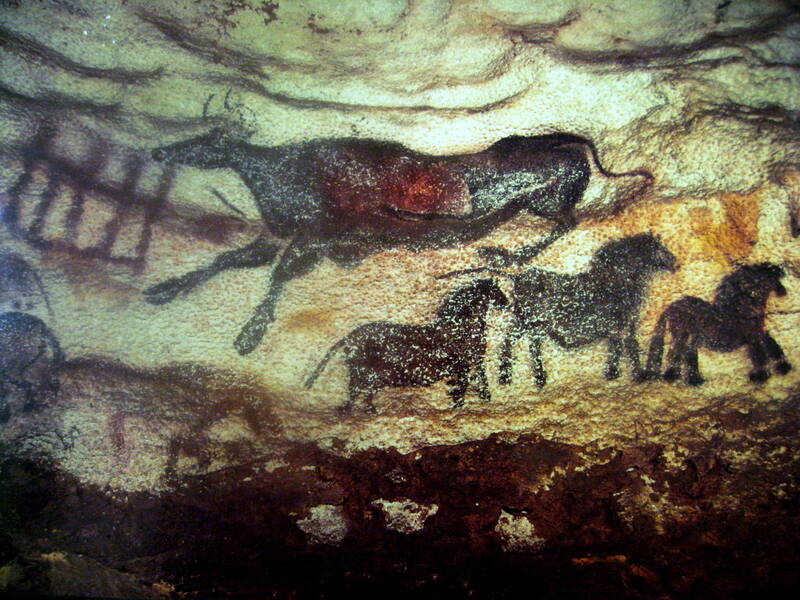 The most famous is Lascaux (las COE) Cave, which contains hundreds of prehistoric paintings. On September 8, 1940, a boy named Marcel Ravidot (RAV i doe) and some of his friends were hiking in the Lascaux hills of Southern France, with Marcel’s dog, Robot (row boe). The boys noticed that the dog had disappeared so they called out for him. The dog did not show up but the boys heard muffled barking that seemed to come from under the ground. After following the sound of Robot’s bark, the boys discovered a steep slanted tunnel, which was really a hidden cave opening. Marcel started down the tunnel entrance and fell into a dark cave where he found and rescued his dog. Four days later, Marcel and his friends returned to the underground cave to explore it. They brought a lamp and some rope with them, so that they could more safely go deeper into the cave. The boys discovered a one hundred-foot long cavern decorated with paintings of deer, bison and bulls on the rock walls. Several passages led off the main path and the boys also had fun exploring these. 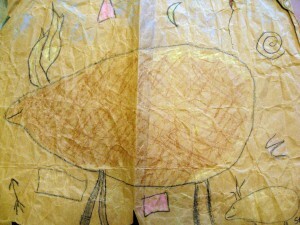 In school, the boys had learned about paintings created by ancient cave artists many thousands of years before. They were sure these paintings had to be the work of these same artists who had lived in those prehistoric times. Although Marcel and his friends wanted to keep their cave a secret, they knew they had discovered something very important! 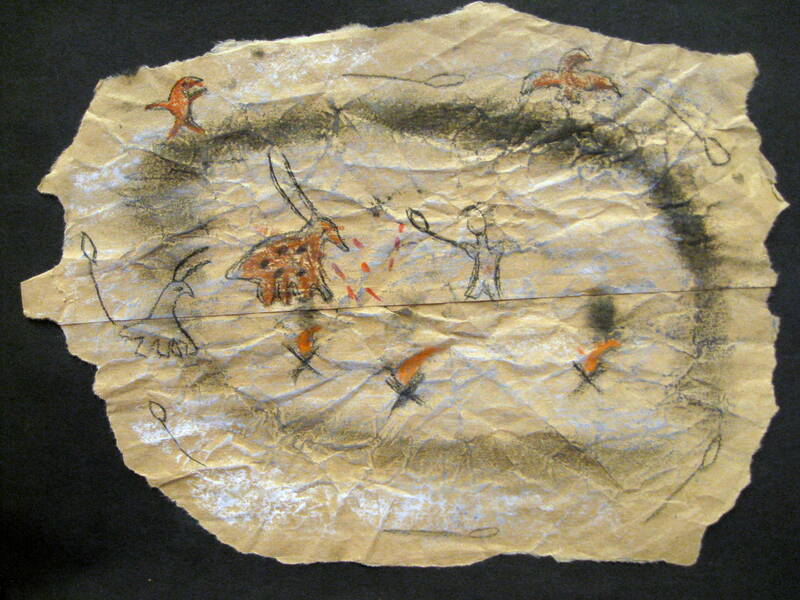 The paintings from the cave had been created about 15,000 years before the boys discovered them. There are more than 2,000 animals painted on the walls and ceilings of Lascaux. The most frequently painted animals are horses. One of the most interesting chambers in Lascaux Cave is the Room of the Bulls. One of the bulls painted there is an amazing 18 feet long! Marcel and his friends were able to work as tour guides after Lascaux was opened for public viewing. Since the opening of the cave, in 1948, thousands of visitors passed through and the warmer air and lighted interior allowed a green algae to grow over the walls, upsetting the cool dark atmosphere that permitted the cave art to survive so many thousands of years. In 1961, the cave was permanently closed to the public. A realistic replica of the Lascaux cave interior has been created and is located near the original cave. Tourists tour through this replica now, which is so lifelike and detailed that tourists are able to imagine they are actually exploring inside and examining the original cave. Lascaux is one of the more important caves yet discovered! 3. “Head of a Bull” Lascaux, France. Section measures 58” x 48”. This is the head of an enormous bull; the complete body of this painted bull (head to tail) measures 18 feet long. Six of these massive animals are painted on the walls of a large hall inside Lascaux Cave, which is appropriately called “The Hall of the Bulls”. The pigment used to make the paint is carbon, or possibly manganese, and the white background is the calcite that covers the cave’s interior. Calcite is the white build up caused from water leaking over the surface of the rock. Over hundreds of years, cave walls might become completely covered with white calcite, and look as if they had been painted white. The large yellow patch on the bull’s neck shows an area where the calcite has fallen away from the wall, exposing the natural ocher color of the rock beneath. When this cave was first discovered, the painted piece of calcite originally covering this area was found lying in fragments on the cave floor beneath the head. The horns of the bull have been drawn in the so-called “twisted perspective” method that is very common in prehistoric art; the head is shown in sharp profile (sideways), yet the horns are turned towards us. Other black lines that surround this bull’s head are symbols, which may have had some special meaning to the artist, which scientists still do not understand. How were the artists able to see in the dark cave for painting? In this particular cave, archaeologists have found more than 100 lamps once used by ancient cave artists. Some of the prehistoric lamps were made of stone, with animal fat held on top, and a wick of twisted twigs. Other lamps were hollowed out rocks that were able to hold more fuel in the indents. A few of these lamps were decorated with painted or engraved marks and designs. The light projected from these lamps flickered on the cave walls and ceiling, much like a candle. Although the lamps did not give off much light, they could last a long time. Scientists have discovered that 10.5 ounces of animal fat could produce 24 hours of light. Measure and mark an area of the room, before your Presentation, that is approximately 18 feet. After telling the class about the size of this bull, have kids stand side by side, with shoulders touching, to fill in this length. How many students did it take to measure an area this size? (K-2) An interesting twist for an art project (if not raining) would be to draw a bull’s head on a corner of the playground, or at the front of the school, and let kids color this with sidewalk chalk. Move the class outside for the activity, then use chalk to outline the bull’s head in the correct dimensions (58” x 48”) and details. Chalk will wash off with the first rain but the entire school will have a chance to view the class artwork. Be sure to discuss the best area to create the work of art with the principal (playground assistants also) and possibly measure and block off the area ahead of time. Be sure to check ahead for the weather report—you will need sunny weather to create the drawing! (Grades 4-5) Use small milk cartons to create *plaster and vermiculite 3-dimensional cubes to carve and create the look of an ancient hollowed out rock lantern. Round outside corners of plaster with rough sandpaper to create a more natural “rocklike” appearance. Dig a shallow indent in the top of the plaster rock lamp. Carve designs on the exterior with a large nail. Wipe with a slightly damp paper towel to remove plaster dust. Begin with the color brown at full intensity. Use a sponge piece to “pat” the paint lightly and loosely over the lantern (do not wipe). Negative areas sponge leaves create texture. One at a time, mix TWO TINTS, ONE TONE and TWO SHADES of brown acrylic paint (lighter and darker values of each) on a paper plate, or piece of waxed paper. Apply with sponge. Allow a few minutes for each color to dry before applying the next so colors do not become “muddy”, creating a more natural rock appearance. *See Project Ideas for Two Reindeer for specific recipe and plaster instructions. An especially recommended COLOR painting lesson project for grades 3 and 4 (also for 5th grade). MONOCHROMATIC COLORS: These colors are different VALUES and INTENSITIES of a single color. Monochromatic colors are closely related colors that make a harmonious color scheme. A lesson on TINTS, SHADES, and TONES of brown can be given as kids paint a realistic plaster “rock” background for a prehistoric rock lantern, a petroglyph, or a pictograph art project. Black, white and at least two VALUES of gray (value denotes lightness or darkness) will also create a realistic rock look. TINT—add the color to white, mixing a little at a time. More than one VALUE of a TINT can be progressively created by adding a little more color each time. SHADE—begin with the color and mix very small amounts of black at a time. Black has the darkest VALUE and can quickly overwhelm the color you are shading if you are not careful. A small amount of black goes a long way when creating shades of color. TONE—since brown is a NEUTRAL COLOR, which is not included on the COLOR WHEEL, adding gray is the only way to create a TONE, because brown has no COMPLIMENTARY COLOR. Dab paint on the raw plaster in light layers with a sponge. Large cell sponges work best. Avoid “brushing” the paint. Lay sponge in paint then blot two or three times on a paper towel or newspaper before “dabbing” (touch, then lift sponge completely) paint on plaster. Dab several times on the plaster before adding more paint. There are more than 2,000 animals painted on the walls and ceilings of Lascaux cave. The most frequently painted animals are horses. These horses had larger heads on thick necks, long tails, and their manes stood up like a stiff brush. This animal is known as the “Chinese Horse” because of its similarity to the related horses in Chinese paintings. Which pigment colors can you see in this painting? Yellow, black and red—the white was the original calcite covering over the cave rock and this artist has artistically used the natural white background to create a light underside to this horse. The red that is shown is not on the horse. 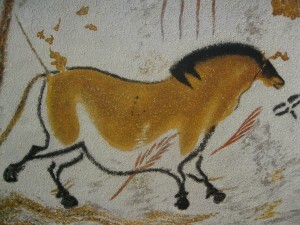 The horse is drawn with a black contour line (outline), its body is painted in with yellow ochre (golden yellow). Red ochre is used for the strange symbols that surround the drawn horse. The stubby, upright black mane has been painted using a technique of blowing the powdered pigment through small hollow bones, similar to modern air-spray methods of painting. 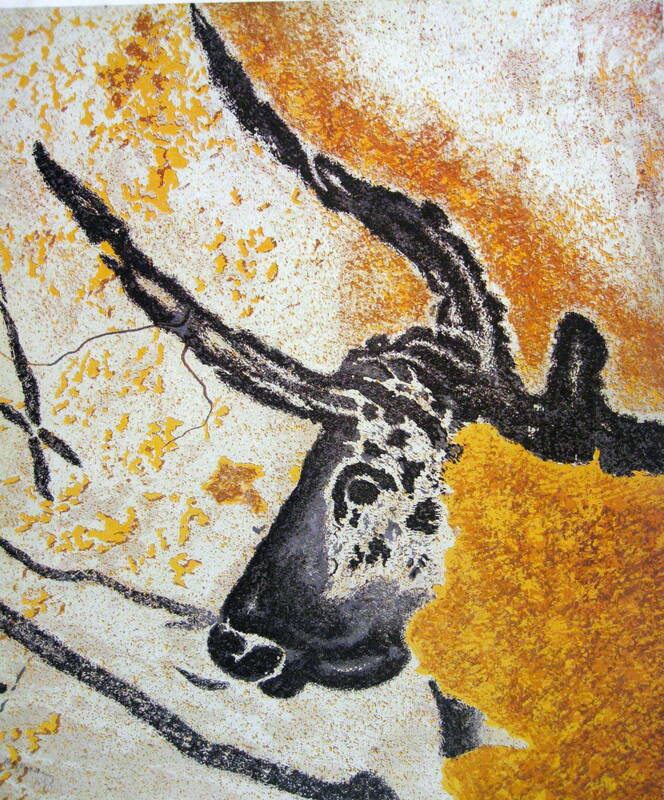 The paints (pigments) used in Lascaux were made from colored stones, or hard chunks of colored clay. Some of the stones were found inside the cave but other colors painted inside Lascaux were found as far away as 25 miles. The different colored stones were gathered and ground into powder between two rocks. The powder was then mixed with animal fat, vegetable oil, blood, or spit to create paint. Archaeologists have also uncovered solid blocks of pigment, which were used by the cave artists in the same way you use crayons. How do you think the artists painted with the paints they made? The artists painted with brushes made from animal hair and plant fibers, and with sponges made from fur. In other caves, artists placed their hands against the cave wall and blew pigment through a small, hollow bone. This method created an outline of color around the hand (the hand created this way became a negative shape). The mane of the horse was painted with this bone spraying technique. Archaeologists have discovered chips of wood and man-made holes full of clay in the walls of Lascaux cave. These two finds, plus the fact that the paintings are 13 feet above the cave floor, have led researchers to believe that the cave artists built scaffolding to stand on. Most horses in prehistoric times were smaller than horses today and they were wild. Prehistoric people did not ride horses or use them for work. Horses were only another animal to be hunted. Horses, bulls, deer and other animals were hunted for several reasons. The animal’s meat provided food, their skins were made into clothing, blankets and footwear, and the bones were used for weapons and tools. Can anyone see how the artist created MOVEMENT in this picture? The horse’s legs are spread out so that it appears to be running. Curved lines often suggest movement. 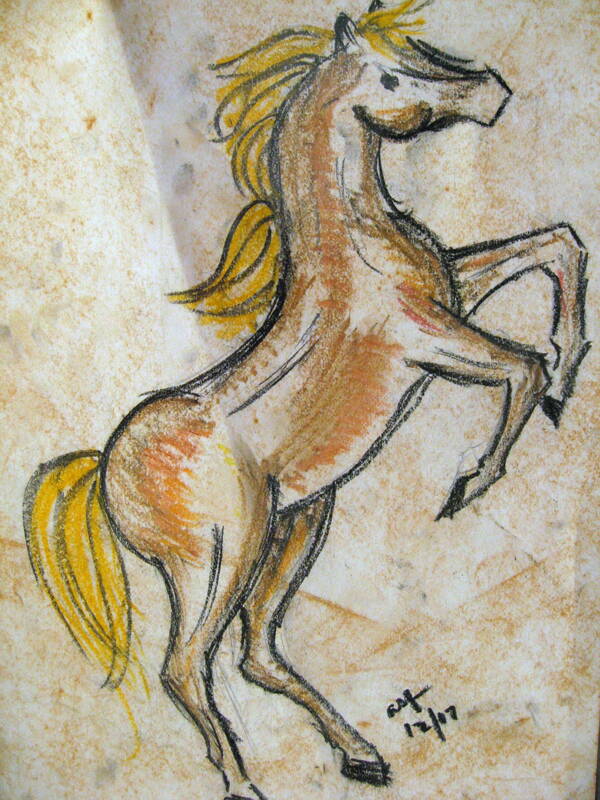 (4-5) Draw a “Chinese Horse”, similar this one, using drawing charcoal. Place a paper towel under drawing hand to help control smearing as you draw. This will be a black and white version with various gray values. Be sure to show movement the way this artist did. Pay attention to the horse’s thick neck and very small head. Lightly shade and blend the edges of light color value into the white underbelly with your fingertips. Create white areas by leaving some spaces uncolored by the charcoal. An eraser can lighten the value of your charcoal when it is too dark. Spray these drawings with hairspray to set the charcoal BUT DO THIS FAR AWAY FROM THE KIDS. Some may be very allergic so take the work home or do this outside, with no children present. This plain and simple title has been given to one of the finest cave paintings yet discovered. The picture is situated on the wall of a long, narrow corridor in the famous cave of Font-de-Gaume, in southern France. Painted some 18,000 years ago, it shows a male caribou reindeer watching over and protecting a female, about to give birth. A female caribou retains her antlers during pregnancy and until after the offspring is born. This is how nature provides the mother deer with a way to protect her offspring after it is born. This is also why both male and female reindeer have the same antlers. Quality artists (ancient or modern) are able to capture moods, feelings and emotions in their work, which is what makes their work a masterpiece. This prehistoric cave painter was definitely a true master! What type of MOOD has the prehistoric artist created in this picture? The picture subject proclaims the innermost thoughts of an intelligent and imaginative human being. The artist must have been a person with a great capacity and understanding of love and kindness, as well as the talent to produce a masterpiece. Sheltering and protective MOOD descriptions also work. This touching and caring scene, almost nine feet long, has been painted on the wall of a narrow passage that is only about one yard wide. While painting this scene, the artist was not able to see it progress from a distance because of the cramped space. Yet, the completed painting is so perfect. The details of the two heads and the overall balance of the animals, all combine to make this painting an example of prehistoric art at its highest level. This painting is not the work of an uneducated, illiterate creature. The artist had to carefully think and plan the painting before he began; in order to have made it fit correctly onto this large, dark, narrowly spaced passageway. The curved lines that appear on the flanks of the female deer represent two partially engraved mammoths, with their backs and trunks clearly visible. Are there more CURVED or STRAIGHT LINE TYPES in this painting? Paint plaster rock plaques that can be hung on the wall when finished. To make the plaques, thoroughly mix together one part water, one part plaster of Paris and 1½ parts vermiculite (used in gardening and for houseplants) in a large container (plastic bucket). Pour mixture into disposable foam, plastic or paper plates (shiny coating type). Aluminum pie tins also work well. Place a small ½ piece of drinking straw through wet plaster to create a hole for hanging (straw can later be pulled out or excess trimmed). Set aside to harden—this will take 5-7 days. Peel off plate to paint with watercolor or acrylic. Begin by painting background colors first (gray, tan, and/or brown). Then, paint animal(s) in natural cave painting colors—red ochre (burnt sienna or terra cotta), yellow ocher (gold), browns, charcoal and white. Students may carve picture into plaster rock plaque (see above) to create a petroglyph. Use a large nail for carving. If rock is too “hard”, lightly dampen with a sponge (this will also help with plaster dust). The cave of Les Combarelles (lay COM buh ray) is situated close to the French village of Les Eyzies (lay EYES), a region dotted with painted caves. For many years, this cavern was a great disappointment because no paintings were found and it was thought to hold no prehistoric works of art. The walls of this cave were covered with deep, vertical scratches, made in prehistoric times by cave bears and mountain lions that used the surface of the rock to sharpen their claws. Then, a great discovery was made! By holding a lamp close to the wall, other lines appeared—deep chiseled grooves that were flowing and horizontal. A prehistoric artist, using a sharp piece of hard flint stone against the softer limestone of the cave wall, created these lines. Thousands of these lines were carefully reexamined, and over 200 animal engravings (petroglyphs) emerged from the mass of crisscrossed meandering scratches. What kind of animal do you see here? What is happening in the scene? This engraving depicts a reindeer leaning forward to drink from a stream; its tongue is clearly seen protruding to lap at the water that once emerged from the cave’s wall. It is one of the most impressive European petroglyphs ever found! Which type of LINES were used to engrave this deer—Vertical, Horizontal, Diagonal, Zig Zag or Curved? Use Woody Dough to create the natural look of a stone petroglyph (*see “Project Recipes” page). Roll dough flat and use a pencil to carve line picture. Do not push too hard because the line should just create a dent in the dough and not push through the back. Use Coffee Dough to create the natural look of a stone petroglyph (*see Project Recipes page) for creating the project described above. It is suggested that you make these dough recipes at least a day in advance, to be sure there is enough dough for the size of project you have in mind. Sandwich bags work well to divide dough evenly ahead of time, rolled into balls, unless you want to give kids a larger piece. Choose the recipe easiest for you to find supplies for. This dough is course but can create a look of natural stone. Sift sawdust through sieve before measuring. You only want the sawdust in your dough—NOT the splinters or chunks of wood! Use your hands to gather the mixture together and mix. Depending on the type of sawdust used, you may need to add more water or flour. Press into a firm glob. Knead the glob until it feels like workable dough. If mixture is too thick, add more water—too thin, more flour. Add only a small amount (a few Tablespoons) at a time! Store dough in margarine tubs or plastic bag but use right away or it will become hard to work with. Roll dough flat and use a pencil to carve a line picture. Do not push too hard because the line should just create a dent in the dough and not push through the back. If you want to hang your project, make a hole near the top with a straw before the slab dries. Let your Petroglyph dry for two to three days. You can then smooth it with sandpaper and glaze with a clear acrylic sealer to reinforce. Optional—Give sealer a few hours to dry and paint with acrylic paint (mix black and white), using a piece of sponge to dab paint and create a natural gray color. Mix at least two gray VALUES. Sponge gently, alternating each gray with black and white, across the dried and sealed project until it is covered with gray paint in several values. It is fine if natural color shows through in places. The different values help give a more natural “gray rock” color and teach a color lesson! This dough has a natural look when it dries. The brown color and coffee-grind speckles look like actual stone. Combine all ingredients in a bowl and stir with large spoon until blended. Gather mixture together with your hands. Knead on a floured surface until you have smooth dough. Store in a plastic bag or margarine tub. Dough will keep for a few days. Create a Petroglyph with this dough in much the same way as with the Woody Dough above. You may also use fingertips to engrave this dough. On Christmas Eve, 1994, Jean-Marie Chauvet and two assistants discovered a huge cavern in Southern France, near Vallon-Pon-D’Arc. The walls of this cave were covered with more than 300 paintings of many extinct animals. Some painting radiocarbon dated to over 31,000 years ago, making them the oldest known images created by prehistoric people. Besides being the oldest paintings, they are some of the greatest and most interesting archaeological and artistic discoveries of the twentieth century. The pigments prehistoric artists used to make paint were charcoal, red hematite, ocher and other colored stone. These pigments were ground into a fine powder, between two rocks known as a mortar and pestle, and then mixed with animal fat to create paint that would harden and stick to the rock walls of caves. The most common prehistoric tools used for painting were simple but effective: fingers, flint scrapers, crude brushes made of animal hair and plant fibers, and hollow tubes of bone used like a modern “airbrush”. With the exception of two tiny horse heads drawn with yellow ochre, the images of Grotte Chauvet were red and black. The red color, reserved mostly for bears, was created with iron oxides or hematite. The black was made with either charcoal or manganese dioxide. The elaborate drawings of Grotte Chauvet include drawings of large lions looking attentively to their right; a herd of wooly rhinos with some of them superimposed on others, one leopard, hyenas, bears and a reindeer. The details of the drawings are intricate, down to the species and gender. The cave had been closed off in a prehistoric landslide so humans had not seen the drawings for thousands of years, which is why they remained in such excellent condition. Much of the Y-shaped, multi-chambered cave, thought to extend about 1,500 yards, is still unexplored.